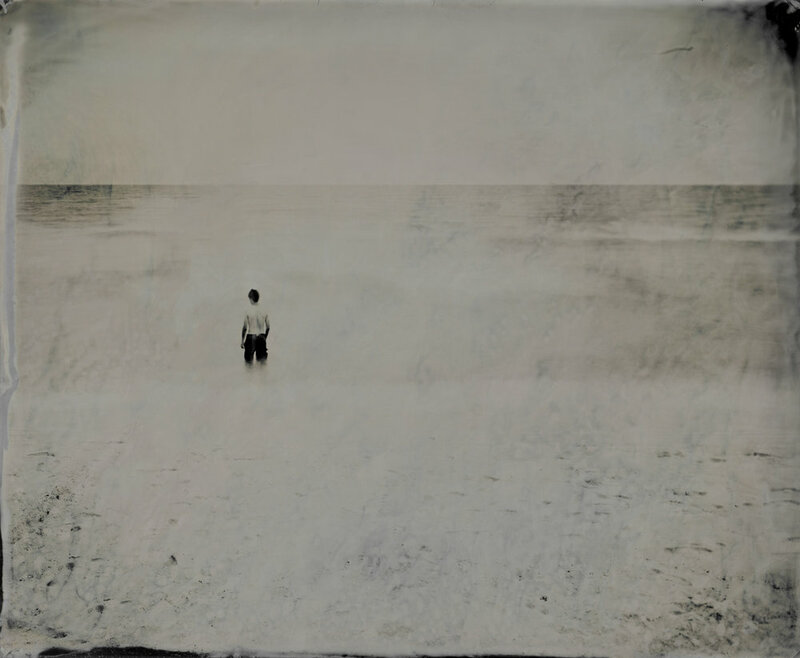 Born in Georgia, Frank Hamrick’s artist’s books combine photography and storytelling with papermaking and letterpress printing to address time, relationships and home. Oxford American Magazine named Frank one of the 100 Superstars of Southern Art. Frank is currently the MFA graduate program coordinator and associate professor of photography and book arts at Louisiana Tech University, in Ruston where has has taught for 11 years. This is the third in a series of handmade artist’s books produced since 2014 focusing on my tintype photographs. Harder than writing a good haiku, published in 2016, features 17 tintype images. Sometimes Rivers Flow Backwards, published in 2014 with an actual tintype inset into the cover, features 11 tintypes in the standard edition and 12 images in the deluxe, gatefold edition. 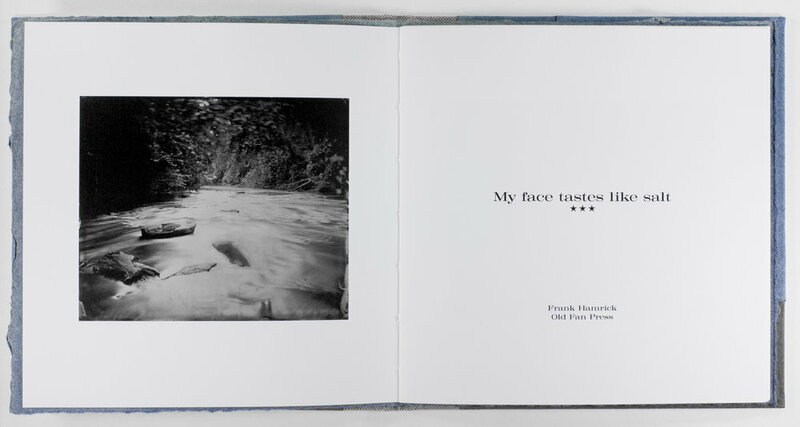 My face tastes like salt is an artist’s book limited to 41 hardcover copies featuring reproductions of eighteen tintypes. 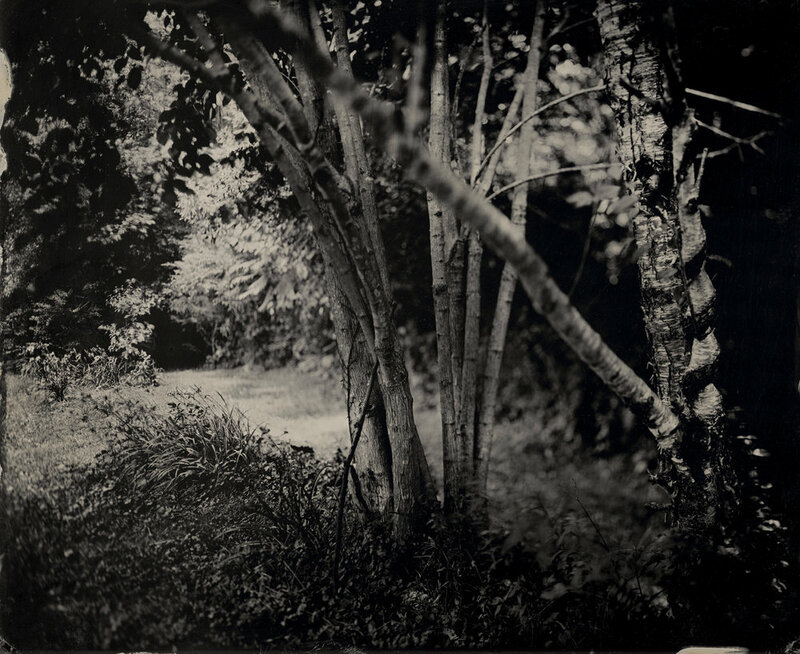 These portraits, still lives and landscapes, originally created as 8x10” and 8x8” tintypes, focus on looking at and moving through the natural world around us. The phrase Harder than writing a good haiku was an analogy I spoke of while helping another artist edit their work to a manageable number of images while leaving enough to still convey the original concept. 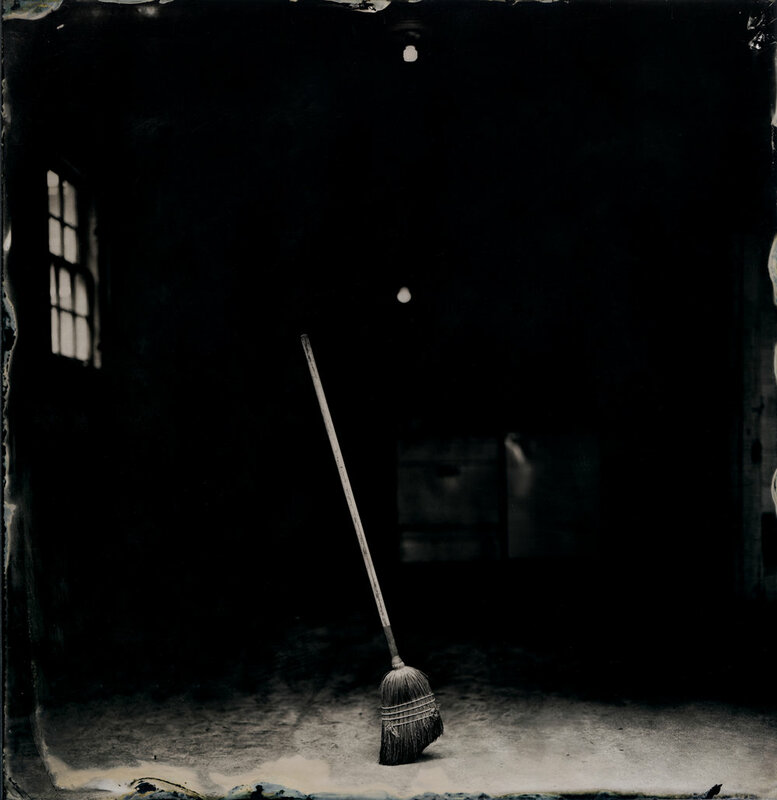 These tintype photographs were conceived as select moments from stories where the hint of a narrative open to the viewers’ interpretation is more important than the specifics of the characters’ identities or where they are located. The scenes depicted are designed to engage whether they are totally familiar or curiously exotic, depending on each viewer’s background. Printmakers are well aware letterpress type and relief blocks are reversed so the final printed images appear right reading. Tintypes present a mirror version of their subject. I understood making a tintype of letterpress characters would create a legible image to embed in the covers of the artist’s book Sometimes Rivers Flow Backwards. 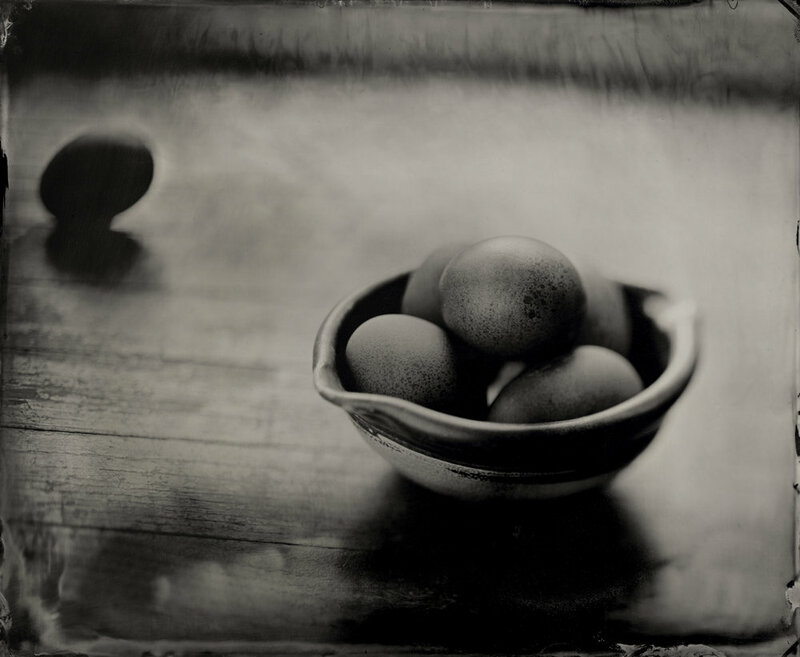 The book largely consists of still life images made around the house in Ruston, Louisiana. Waterways periodically reverse due to hurricanes, floods and earthquakes, but people protesting against the actions of their leaders inspired the book’s title. Artist’s books allow me to mix analog and digital processes to convey my ideas in a way that stands out from other forms of art. The artist’s book is a favorable alternative to the traditional method of exhibiting photographs on the wall. Artist’s books do not require costly matting and framing to be presentable. More importantly, the artist’s book provides an experience other mediums cannot. It is a time based medium, similar to theatre and music, but it is also a physical piece of work the viewer must hold and interact with to understand. The viewer has an intimate relationship with the book by feeling its textures and turning its pages, instead of viewing an image on the wall across the room. If a photograph is considered in the same manner as a single song, then an artist’s book is similar to an entire album of music complete with cover art and liner notes. 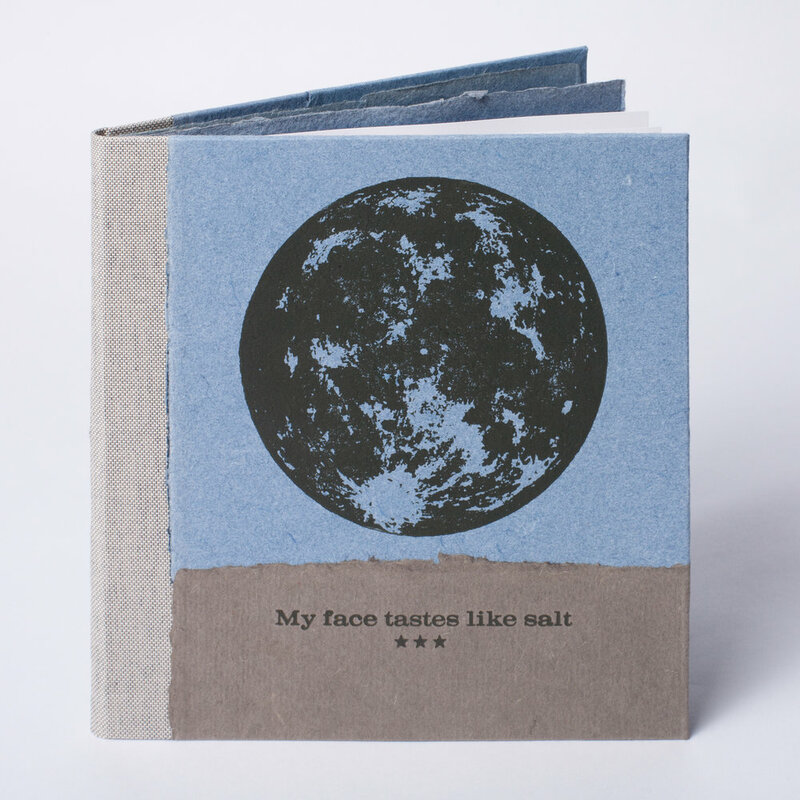 Artist’s books allow for the combination of images with text and the incorporation of materials, like handmade paper, and processes, such as letterpress, staining, and layering various colors of paper to create limited edition works of art that can convey a more complete, realized idea than a single image is capable of doing. Some of my photographs are constructed images where I consciously decide what to leave in and what to leave out. Other images are simply my documentation of what I see as being notable, whether it is good, bad or something I realize is impermanent and will be seen by others only if I take the time to save it in the small way I can. The pieces I make have particular meaning to me, but I understand other people will interpret them in their own way. My photographs are not necessarily created to illustrate or provide answers. If anything, I would prefer for the images to generate more questions. I do not see them as endpoints, but rather starting places where I give the viewer ideas to ponder and allow room for their imagination to create the rest of the story. Photography is taught within the School of Design at Louisiana Tech University, which includes degree programs for architecture, interior design, graphic design and studio - drawing, painting, printmaking, ceramics, sculpture, art history, book arts, photography, video, etcetera. I work with BFA undergraduates and MFA graduate candidates. Photography has both digital and analog labs along with a lighting studio, critique classroom and camera equipment available to photography/video students. Upper level undergraduate students and MFA students have access to private studios across the street from our main art facility. Our University also features The Thingery, which is a facility open to the entire University community that features facilities for screen printing, 3D printing, laser cutting, vinyl cutting, a wood shop, sewing facilities and more where entrepreneurial individuals from areas such as art, design, engineering and business can develop ideas and prototypes for products they aim to brand and produce. Additional scholarships are awarded to in-progress undergraduates towards the end of each school year based on the students’ GPA and faculty recommendations. Art 564 - Graduate Seminar - 1 hour course taken by all the MFA candidates each quarter regardless of their medium or how far along they are in the program. This course focuses on issues surrounding the MFA candidates' art making, such as developing their resumes, biographies, artist statements, thesis papers, submitting to exhibitions, speaking publicly about their work and the work of others, promoting themselves, and hanging exhibitions in the School of Design’s galleries. The photography courses I teach range from freshman intro up to MFA graduate thesis, including digital photography, medium and large format analog, alternative processes, studio lighting, portfolio, and history of photography. I also teach video and book arts courses. It is important for students to know how to make photographs rather than just take pictures. Learning as many tools and processes as possible is one way towards accomplishing that goal so a student creating photographs uses a particular camera and output method because they have made an informed decision as to what is the appropriate route to take for their work rather than simply going a predetermined path because it is the only tool or process they know how to use. My students learn methods ranging from camera obscuras and tintypes to digital photography and video. Describe the process of output for photographs. Are students encouraged or required to make prints? Yes, students make both digital and darkroom prints. In a screen saturated world, it is important to know how to produce a well executed physical piece of work. Describe the critique format. Do all critiques happen in class? Yes, critiques are during class. The format evolves from one project to the next especially with undergraduate students. Sometimes I will have all the students write responses before speaking about the work so I can see their ideas on paper instead of impressionable students having their view of the work being influenced by more outgoing peers. Sometimes the student's peers will first respond to the work and I will follow up with anything they missed. Other times the graduate assistant or I critique the work first, responding directly to what the photographs show and suggest, rather than having the student who made the work telling us what the work is supposed to be about. Towards the end of the intro course and later in the upper level courses the student who made the images introduces the photography and they have to acknowledge what is and is not successful about their work before opening the discussion the rest of the class. In the lower level classes I try to also provide written feedback when the students receive their grade as it can be overwhelming for students in the moment of the class critique to remember and understand everything being said in response to the work. I provide less written feedback as the students move into their upper level classes and graduate level courses, although I do encourage students to take notes during critiques or better yet, have a peer take notes for them so the student who made the work can focus on speaking, listening and responding to remarks and questions in real time. There is a less structured critique format in the upper level courses where the student’s peers and I all talk together about the work in response to what the student is presenting and also saying/writing about their own work. One of the concepts I stress is that a good photograph will often subjectively suggest beyond what is objectively shown. I will ask students what is this a photograph of, and then ask what is this a photograph about. The image is usually not that interesting if the response is the photograph is of a chair and it is also about a chair. A better photograph might be of a chair but suggest a character has walked out of the scene, which might hint at loneliness or an argument. Eliot Dudik is a great photographer and book artist who seems to be doing a lot to build up the photography program at the College of William & Mary. He is regularly posting envious images of his student’s work on social media. Meg Griffiths, who is currently teaching at Texas Woman’s University is a great photographer who has made a book about her time in Cuba.